These images are from the 2016 Stars on Ice show that took place in Saint Paul, Minnesota. Madison Chock bask in a blue spotlight at the start of the 2016 Stars on Ice show in St. Paul, Minnesota. Longtime ice dancers, Meryl Davis and Charlie White, demonstrate the passion that has led them to medal after medal, as they perform at the 2016 Stars on Ice show in St. Paul, Minnesota. Ice dancer Maia Shibutani and singles skater Jeremy Abbott skate together during a unique and rare partnership at the 2016 Stars on Ice show in St. Paul, Minnesota. Always the gentleman, Jeremy Abbott takes the hand of Maia Shibutani during the opening number at the 2016 Stars on Ice show in St. Paul, Minnesota. Two skating superstars, Jeremy Abbott and Maia Shibutani, strike a power pose during their performance at the 2016 Stars on Ice show in St. Paul, Minnesota. Star skaters Gracie Gold and Polina Edmunds dance with joy on the ice at the 2016 Stars on Ice show in St. Paul, Minnesota. Polina Edmunds is bathed in red light as she performs at the 2016 Stars on Ice show in St. Paul, Minnesota. Olympian Polina Edmunds shows off her brilliant smile during her solo performance at the 2016 Stars on Ice show in St. Paul, Minnesota. Ice dancers Madison Chock and Evan Bates seduce the audience with their moves at the 2016 Stars on Ice show in St. Paul, Minnesota. Madison Chock appears to look directly into the viewer's eyes as she skates with partner Evan Bates at the 2016 Stars on Ice show in St. Paul, Minnesota. Ashley Wagner enjoys a moment with her close friend Adam Rippon, as she introduces him at the 2016 Stars on Ice show in St. Paul, Minnesota. In another life, perhaps singles skaters and close friends, Ashley Wagner and Adam Rippon may have made a wonderful pairs team. Ashley is seen here introducing Adam before his solo routine at the 2016 Stars on Ice show in St. Paul, Minnesota. Adam Rippon lands a jump with a shower of ice at the 2016 Stars on Ice show in St. Paul, Minnesota. Sibling ice dancers Maia and Alex Shibutani, skate with grace during their performance at the 2016 Stars on Ice show in St. Paul, Minnesota. The ice dance duo of siblings Maia and Alex Shibutani, affectionately known as the ShibSibs, dance together at the 2016 Stars on Ice show in St. Paul, Minnesota. Fiery Ashley Wagner shows off enough sass to melt the ice at the 2016 Stars on Ice show in St. Paul, Minnesota. Ashley Wagner listens to the cheers of the crowd as she performs at the 2016 Stars on Ice show in St. Paul, Minnesota. The always lovable Jeremy Abbott, shows the crowd some love at the 2016 Stars on Ice show in St. Paul, Minnesota. Gracie Gold strikes a pose so stunning, that even her shadow looks good, at the 2016 Stars on Ice show in St. Paul, Minnesota. 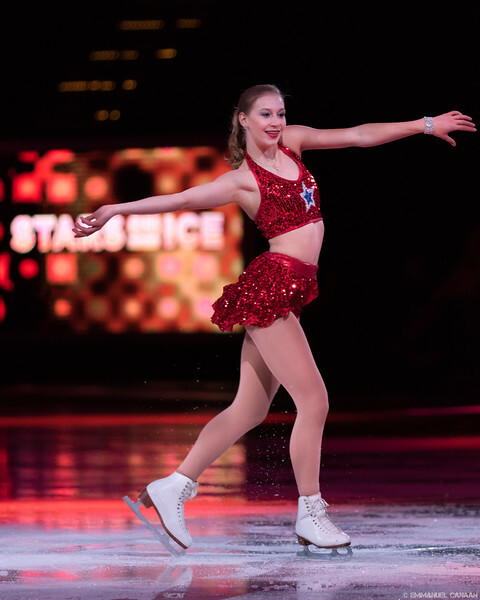 The shining star of any event she attends, Grace Gold puts the "Star" in Stars on Ice during her performance at the 2016 event n St. Paul, Minnesota. The magnificent beauty, Gracie Gold, spreads her arms wide during her performance at the 2016 Stars on Ice show in St. Paul, Minnesota. Adam Rippon shows off his powerful physique during his performance at the 2016 Stars on Ice show in St. Paul, Minnesota. Adam Rippon illuminates the arena with his star power at the 2016 Stars on Ice show in St. Paul, Minnesota. Polina Edmunds shows off her mastery of the spiral during her performance at the 2016 Stars on Ice show in St. Paul, Minnesota. Polina Edmunds shows some of the angelic beauty that makes her such a joy to watch as she performs during the 2016 Stars on Ice show in St. Paul, Minnesota. With a heart on her boot and and the heat of partner Evan Bates in tow, Madison Chock steals the hearts of the audience as well during a performance at the 2016 Stars on Ice show in St. Paul, Minnesota. Madison Chock channels her inner Elvis during her performance with Evan Bates at the 2016 Stars on Ice show in St. Paul, Minnesota. Madison Chock and Evan Bates show the crowd how the cool kids skate at the 2016 Stars on Ice show in St. Paul, Minnesota. Madison Chock's knight in shining armor, Evan Bates, rescues her from the perils of the ice at the 2016 Stars on Ice show in St. Paul, Minnesota. Ice dance partners Madison Chock and Evan Bates skate hand-in-hand at the 2016 Stars on Ice show in St. Paul, Minnesota. 2016 World Silver Medalist Ashley Wagner, performs a beautiful spread eagle at the 2016 Stars on Ice show in St. Paul, Minnesota. Ryan Bradley channels his inner astronaut during a backflip at the 2016 Stars on Ice show in St. Paul, Minnesota. Skating superstar Gracie Gold reaches towards the source of her power at the 2016 Stars on Ice show in St. Paul, Minnesota. Stunning beauty Gracie Gold skates through a sea of purple light at the 2016 Stars on Ice show in St. Paul, Minnesota. Olympian Gracie Gold sparkles in the purple light of the 2016 Stars on Ice show in St. Paul, Minnesota. In the land of Prince, skating royalty Gracie Gold, performs in a shower of purple light at the 2016 Stars on Ice show in St. Paul, Minnesota. 2016 U.S. National Champion, Adam Rippon, shows some of the passion that got him to the top at the 2016 Stars on Ice show in St. Paul, Minnesota. Skating star Adam Rippon stuns the crowd with a split jump at the 2016 Stars on Ice show in St. Paul, Minnesota. Adam Rippon mimics the elegant lines of a crane as he spreads his wings at the 2016 Stars on Ice show in St. Paul, Minnesota. Superstar Ashley Wagner shows intense passion during her performance at the 2016 Stars on Ice show in St. Paul, Minnesota. Olympian and World medalist, Ashley Wagner, shows off the beautiful lines of her body in the spotlight at the 2016 Stars on Ice show in St. Paul, Minnesota. Charlie White chases ice dance partner Meryl Davis, as she coyly escapes his grasp at the 2016 Stars on Ice show in St. Paul, Minnesota. Charlie White gallantly carries his longtime ice dance partner Meryl Davis at the 2016 Stars on Ice show in St. Paul, Minnesota.